Today’s Health Department is headed by Secretary Francisco Duque, who previously was a DOH consultant reporting directly to Noynoy Aquino-era DOH Sec. Janette Garin. President Rodrigo Duterte tasked the Public Attorney’s Office was tasked by to handle Dengvaxia cases of any affected family who requests for assistance. 1. 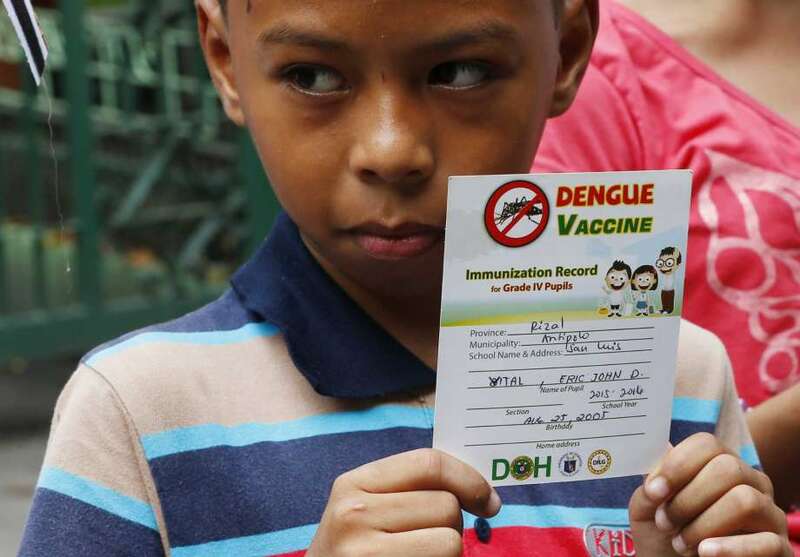 Dengvaxia Card – A small card issued by the DOH at the time of vaccination, detailing the who was vaccinated, where the vaccination took place, and when the recipient received Dengvaxia doses. This serves as prima facie evidence that the child indeed received Dengvaxia. 2. Death Certificate – This document states the date and cause of death. 3. Medical Abstract – A concise summary of the Dengvaxia recipient’s condition, usually issued by a qualified medical professional around the time of the recipient’s death. Without these basic documents, winning a Dengvaxia case will be severely prolonged, if not impossible. Several Dengvaxia parents recently told PAO that the Department of Health has been attempting to get their original records in exchange for Php 50,0000 medical assistance. While it’s true that President Duterte instructed DOH to extend financial assistance, the President DID NOT order DOH to take away evidence from the victims’ kin. But that’s what DOH did. TRANSLATION: DOH said they need to get my child’s original Death Certificate and Dengvaxia Card in exchange for Php 50,000 cash. "Ikalawang linggo ng Hunyo 2018, kami ay linapitan ng mga empleyado ng DOH upang kausapin… tinanong ako kung may utang ako sa hospital… (at) inalok [na] kanila itong babayaran… Kung ako ay papayag, hihingan nila ako ng mga document… tulad ng… death certificate, Dengvaxia card, at Medical Abstract… daw… para mabayaran ang hospital bills…"
TRANSLATION: On the second week of June 2018, a DOH employee approached us for a conversation, asked me if I still have debts with the hospital, and offered to pay them off. If I agree, they asked me for documents like death certificate, Dengvaxia card, and Medical Abstract, supposedly as a requirement for them to pay the hospital bills. “Bigla akong hinarang ng... nagtratrabaho sa San Rafael Rural Health Center na kung saan ang aking anak ay tinurukan ng Dengvaxia vaccine... Sabi nila, kukunin nila ang… Dengvaxia Card… kapalit ng limampung libong piso (Php 50,000.00)." TRANSLATION: Workers from San Rafael (town) Rural health center, where my child was vaccinated with Dengvaxia, suddenly approached me. They said they’ll get the Dengvaxia card in exchange for Php 50,000. TRANSLATION: The DOH has requirements before they extend assistance. He asked for the Dengvaxia Card in exchange for Php 50,000.00 burial assistance. TRANSLATION: The barangay (village) captain and DOH workers approached us and tried to convince us to accept Php 50,000 in exchange for withdrawing the case. TRANSLATION: We went to the health center and upon arrival, a nurse approached us and asked if we want to avail of Php 50,000 assistance in exchange for the Dengvaxia Card. TRANSLATION: DOH officials told me that I need to go to DOH-Tayman and surrender my Dengvaxia Card before I can get the Php 50,000 financial assistance. “Pagdating ko ng aming bahay ay inabot sa akin ni Jimmy ang listahan ng dokumento na kailangan naming… isumite sa DOH upang makatanggap kami ng financial assistance… na… Php 50,000. Ang listahan ng dokumento na isisumite naming na hinihingi… ay parehong-pareho sa listahan ng dokumento na isinumite naming sa Public Attorney’s Office kaugnay ng kasong isinampa namin. 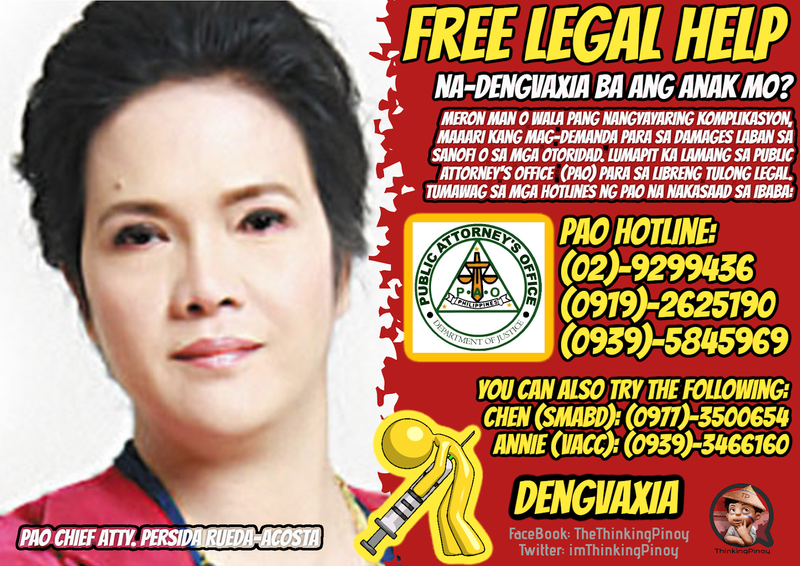 Ilan po sa mga… hinihingi… ay Dengvaxia Card at Death Certificate ng aking anak na si Joaniña. TRANSLATION: After coming back to our home, Jimmy (witness' son) handed me a list of documents that we need to surrender to the DOH in order for us to receive a financial assistance of Php 50,000. The list of documents to be submitted is totally identical to the list of documents we submitted to the Public Attorney's Office in relation to the case we filed. Among the documents listed is the Dengvaxia Card and Death Certificate of my daughter Joaniña. Ang nurse na nagturok ng dengvaxia vaccine sa aming anak at isa pang tao na nagpakilalang director ng DOH ay nagtungo sa aming bahay. Inalok po nila kami ng Php 50,000 kapalit ng pag-surrender ng mga original copy… Dengvaxia Card. TRANSLATION: The nurse who vaccinated my child and another person who claimd to be DOH Director visited my home. They offered Php 50,000 in exchange for the original Dengvaxia Card. TRANSLATION: In exchange for the Php 50,000 assistance, I was required to submit the Dengvaxia Card, Death Certificate… I didn’t accept it. TRANSLATION: The DOH told us the government is extending assistance in the amount of Php 50,000 but before I receive the said assistance, I would have to surrender the original Dengvaxia Card and Death Certificate of my child Angelica. TRANSLATION: The health center nurse said, “I am here to offer you assistance from the government in the amount of Php 50,000.00 in exchange for the Dengvaxia Card, Death Certificate, and Clinical Abstract. After a month, Nurse Janine visited me again. This time, she was with a supposedly a high ranking DOH official, a village councilor, and other nurses. I rejected the offer again. I’d rather starve than accept that money. I seek justice for my child’s death. TRANSLATION: The didn’t hesitate to ask me if I have the dengvaxia card with me. After they found out that PAO has the documents, they tried to persuade me to retrieve it and hand it to them… as proof of the Php 50,000 financial assistance. TRANSLATION: DOH-Mandaluong told me that I need to surrender the Dengvaxia Card (among other requirements). After collecting all the original documents on the Dengvaxia Vaccine, I wondered if my child’s life is just worth Php 50,000. Instead of going to the DOH Main Office, I approached the Public Attorney’s office to ask for help so I can seek justice for my child. TRANSLATION: We buried our child. After a week, a health worker visited our home to offer us Php 50,000 as supposed financial assistance but in exchange, they want us to surrender the Dengvaxia Card , surrender the Death Certificate, and sign a certain document. TRANSLATION: I attended a conference about Dengvaxia victims in September 2018 at the DOH and I learned from there that they have Php 50,000 to give out as soon as we complete the requirements like the certification that our child was injected with Dengvaxia. The statements quoted in the previous section detail the Health Department’s attempts at the grassroots level to sabotage the cases of Dengvaxia victims. To add insult to injury, DOH used President Duterte’s own name to steal evidence away from the victims, even if helping the victims is the only thing President Duterte said. 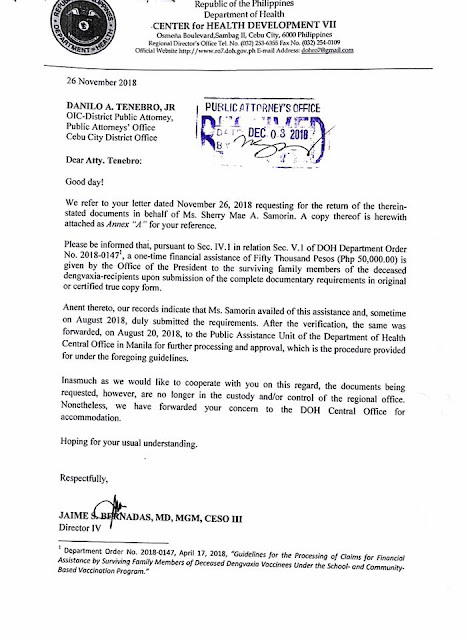 In November 2018, the Public Attorney’s Office wrote to DOH Region 7, asking the latter for the Dengvaxia Card, death certificate, and other original documents that the latter received from a Cebu City complainant. In short, Dengvaxia victims who availed of the P50,000 assistance will find it even harder to file a case, let alone secure a conviction, because DOH is holding their evidence hostage… in exchange for a measly sum of Php 50,000. But the DOH’s efforts do not end there. Several top-ranking government officials and even a very prominent Dengvaxia advocate have been attempting to persuade PAO Chief Acosta to exonerate DOH Sec. Duque. This is despite their knowledge that such a proposal, aside from being a a ground for disbarment of PAO lawyers, is a shameless betrayal to the Dengvaxia victims who want nothing but justice for their dead children. Fortunately, PAO has consistently and vehemently objected to these advances.